LoanAdda helps you to choose the best and affordable offers on your personal loan, through our online EMI calculator, which calculates flexible repayment options for you. LoanAdda online EMI calculator helps you to calculate the EMI amount that need to be paid out every month on your personal loan application. LoanAdda helps you choose from personal loan offers across top Banks and NBFCs at your fingertips. 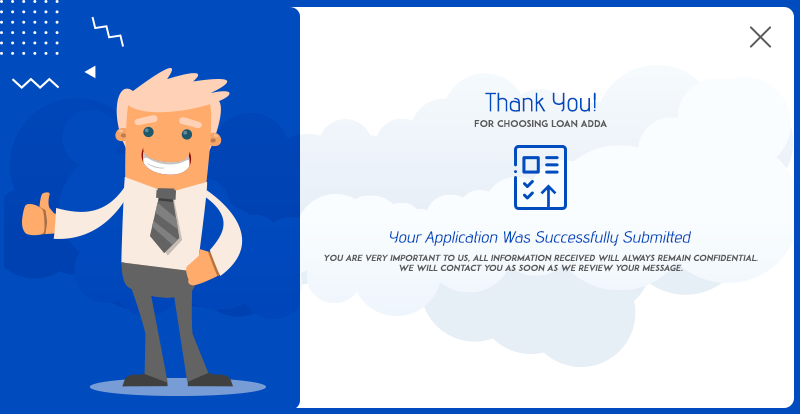 With LoanAdda apply for a personal loan & enjoy benefits such as online application, Instant Personal Loan approval, multiple personal loans offers etc. Thinking of taking the vacation you are planning forever? Or has that fancy new bike caught your eye? Unexpected cash crunch and unplanned expenses can crop up at any time in our lives. To meet all your financial needs, opting for a personal loan is a viable option. With a personal loan there is no restriction on the usage of loan money so whether you are organizing a marriage function or looking to buy a high-end gadget or looking to renovate your house, a personal loan comes handy with added benefits like need of zero collateral and instant access to funds. Personal loan has emerged as a great way to finance trips and purchases that otherwise seems far off with a regular paycheck. Personal loan is an unsecured form of loan, in which there is no need of collateral or any kind of security, which is there to help you for your immediate requirements. It is a multi-purpose loan and therefore it can be used for various purposes including wedding, home renovation, financing your Childs education, for travel purpose and more. Moreover, there is no restriction for the amount you borrow and no one asks you that for what purpose you require the loan amount. In fact, a personal loan can also help you to build your credit score faster when compared with other forms of credit. This is because of the risk it carries due to being unsecured, as it is considered advantageous for the borrower and less advantageous for the specific lender as no security is involved. One of the benefits which are associated with an online personal loan is that it is unsecured which means that you get the entitlement of not providing any collateral to the lender. Basically, you don’t need to give an explanation for why you want to avail a personal loan or to provide any collateral as a security to the specific lender. You can get a low-interest personal loan easily if you meet the eligibility requirements, and have a good and a healthy credit score. This is another major feature of a personal loan, as no one likes to provide bile of documents, and thus due to digitalization, this process has been made easy as now only minimal documentation and verification is done. All the process has been made easy and digitalized. Thus, giving you one more advantage to avail a personal loan. You can avail personal loans that are quick and easy in approval. Personal Loans have set a trademark of giving instant approvals with a streamlined process. Being multipurpose in nature is what makes a personal loan as the most desirable option in terms of financial product. As unlike other financial products you can avail it for a variety of reasons, starting from financing a wedding or financing your child’s education or to consolidate your debts. Innumerous reasons with just a simple solution. Loan Amount Up to 40-50 lacs depending on the credit profile and the applicants profile. Everyone wants certain changes in their lifestyle, some do it by getting new accessories and some like to remake or remodel their house. Well, remodeling the entire house requires major amount of finances. And for this availing a personal loan is beneficial as you can get the approval instantly and don’t have to wait for weeks and weeks to get the approval. And hence, you can start off with your renovations. In India, having a sumptuous wedding is what every Indian plans on doing. More than a ceremony it is considered as a ritual to spend a lot on weddings. Well, this is the culture we have been following. So for making it to look like lavish wedding, one ends up spending most of it is saving, whereas some require finances for setting up a wedding. This is where personal loan comes as a savor, as you can apply online personal loan and cover the expenses. Travelling with family, requires more money, as being the head of the family you are required to take care of all the expenses, or if you plan to travel alone, then also having a good amount of money is always like a cherry on top. Well, a personal loan makes your travelling easy. As you can avail a personal loan instantly and then accordingly plan a fun and memorable vacation. Stressed with various debts being piled up? Various debts makes it difficult for the applicant to remember the various EMI’s they have to pay and missing out an EMI will result as a default in your credit score. Avail a personal loan, and instead of continuing with various debts and paying so many EMI’s, just continue with one personal loan and stay tension free. The top up of a personal loan is a facility which is provided by financial institutions such as banks and NBFCs, to customers that allow you to borrow a certain amount of money over your personal loan which are going on live. The interest rate for a top up loan is slightly higher than the regular personal loan, as you are availing more amounts on your personal loan. Did you know you can save thousands of money on your interest costs on a personal loan? Sounds amazing, right? Well, that is what a balance transfer does and helps you with it. In balance transfer you can pay off your existing loan with a new loan at a lower-interest rate. Why should you apply for a personal loan at LoanAdda? LoanAdda is a one-stop solution for all your financial requirements. In here, we try to provide you with the best services that are hassle-free and streamlined in nature. For personal loans, we provide you with a variety of comparative analysis of what different banks and NBFCs are offering and assist you in your final decision. LoanAdda offers you with 24*7 services for all its customers. You can contact our professionals at anytime of the day. Moreover, the process for applying for a personal loan till its approval is fast and quick in nature. Incase of any queries you can simply write to us at support@loanadda.com for any grievances, complaints or feedbacks. With more than 40+ lenders as partners, you can compare the different offers of various financial institutions to make you take a better option of a personal loan. We help you to find the best lender as per your eligibility needs. There is a personalized relationship with lender for every customer who helps him/her select the bank of his/her choice. Our customer support team is fast and efficient to clear all your doubts such as the personal loan eligibility, its procedures, its offers, its documentation and also the repayment options. We even contact with the respective lender on behalf of you. An Instant One Time Password (OTP) will be sent on your number, and thus, your application has been processed further. After filling all your details, you’ll get an e-approval of a specific amount instantly, and then our executives will co-ordinate with you till disbursals. Now you need to visit multiple branches to fulfill your requirements of a Personal Loan. LoanAdda helps you choose from personal loan offers across top Banks and NBFCs at your fingertips. With LoanAdda apply for a personal loan & enjoy benefits such as online application, Instant Personal Loan approval, multiple personal loan offers etc. LoanAdda in association with its 45+ lending partners brings you the lowest personal loan interest rates on best offers for your personal loan requirements. Our personal loan interest rates start as low as 10.75%, with additional benefits and special personal loan rates for women applicants. Our whole process is secure and digitized enabling us to serve you quicker and with optimum transparency, free of any hidden surplus charges. Fill in the Personal Loan Application Form, to check your eligibility. Compare various Personal loan options, and apply for the suitable option.